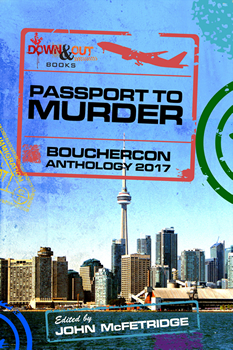 PASSPORT TO MURDER is published in conjunction with Bouchercon, the World Mystery Convention, held in 2017 in Toronto, Ontario. As with the convention itself, the anthology spreads a broad canopy across a wide variety of crime writers from across the country and around the world—including both veteran writers and the brightest up-and-coming talents in the field. All of the stories include some kind of travel, ranging from a cross-America ride-sharing trip to tourists in Italy and Japan, to a woman on the run in Mexico, to murder in Cuba. And even a haunted hotel in Toronto. Edited by John McFetridge. Stories by Eric Beckstrom, Michael Braken, Craig Faustus Buck, Susan Calder, Hilary Davidson, Michael Dymmoch, John Floyd, Chris Grabenstein, Marie Hannan-Mandel, Janet Hutchings, Marilyn Kay, Su Kopil, Rosemary McCracken, Tanis Mallow, LD Masterso, Gary Phillips, Karen Pullen, KM Rockwood, Scott Loring Sanders, Shawn Reilly Simmons, John Stickney, and Victoria Weisfeld. John McFetridge is the author of four novels in the Toronto series, and the Eddie Dougherty trilogy set in Montreal in the 1970s. He is also the co-editor, with Kevin J. Anderson, of the anthology, 2113; stories inspired by the music of Rush, and co-editor with Jacques Filippi of the anthology Montreal Noir.